Toddler Church for 2 & 3 year olds (too old for nursery, too young for Children's Worship) is held downstairs in Room 2 during the morning worship service. (Check the bulletin to know when your child is dismissed to go downstairs.) Toddler Church runs throughout the year and does not take a break in the summer. Please feel free to bring your children to Toddler Church any time you feel they are ready to participate as there is no need to wait until the beginning of a new school year to join this group. 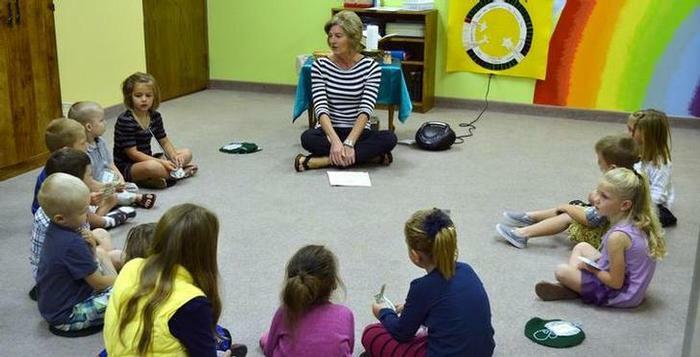 Toddler Church is staffed by parents and other volunteers. For more information, contact Stefanie Behrens or Natasha Hooyer. Children's Worship is a program designed to introduce the elements of worship to preschool aged children in a format that is age-appropriate. This worship time happens during the morning service--watch the bulletin to know when your child is dismissed to go downstairs. Our Children's Worship season begins in September and runs through May. Orientation lessons are taught at the beginning of each season and are dedicated to helping the children learn the routines of their worship time. Parents are welcome to attend orientation sessions, too. Sunshine Room: A worship service for children that are 3-4 years old is held in Room 10. Children must be 3 years old by Sept. 1 before they join the Sunshine Room class. Rainbow Room: Children aged 4-5 years (pre K) meet for worship in Room 17. Children must be 4 years old by Sept. 1 before they join the Rainbow Room class and may continue to attend until they enroll in Kindergarten.